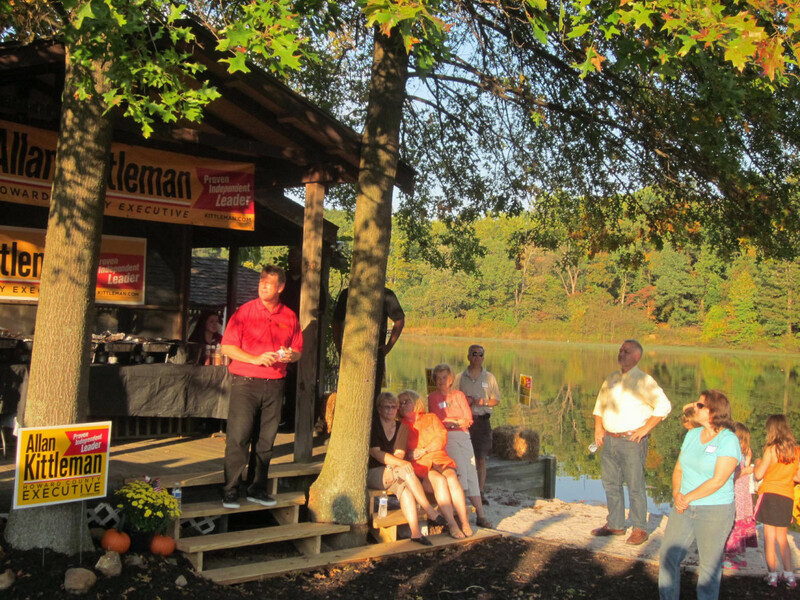 Sen. Allan Kittleman in red shirt addresses crowd at his picnic Sunday. Nick Stewart with wife Katie, who were celebrating their anniversary at his announcement. DISTRICT 12: Add one new candidate for the three open seats in District 12, the Baltimore-Howard County district: Nick Stewart, a Saul Ewing law firm associate and speechwriter for Gov. Martin O’Malley in the early days. Departing Del. Jimmy Malone introduced Stewart, saying he was only the second of the more than dozen Democratic candidates he was supporting for the only legislative district in the state with three open seats. Stewart is 29 and the crowd of about 70 in Arbutus was definitely on the young side of 40. Also attending the event was realtor Jim Hyatt, who was about to announce for one of the three seats, but told MarylandReporter.com the race had put too much of a strain on his family as he sought to juggle the demands of the campaign and the real estate firm he runs. GEEZER CEILING: Anyone in their 30s joining the General Assembly will find a body run by people old enough to be their parents, or even grandparents. With little change expected in the leadership at the top, committee chairs will likely stay the same. Here’s a rundown of the legislative leadership, with their current ages and length of service. Senate President Mike Miller, 71, 26 years as president, the longest serving presiding officer of a legislature in the United States and in Maryland history, 38 years in the Senate. House Speaker Michael Busch, 66, 10 years as speaker, longest service as speaker in Maryland history, 26 years in the House of Delegates. Del. Sheila Hixson, 80, 20 years as chairman of the House Ways & Means Committee, 37 years in the House. Del. Joe Vallario, 76, 20 years as chairman of the House Judiciary Committee, 38 years in the House. Del. Dereck Davis, 47, 10 years as chairman of the House Economic Matters Committee, 18 years in the House. Sen. Nathaniel McFadden, 68, President Pro Tem and vice chair of Budget and Taxation, 18 years in the Senate. Sen. Joan Carter Conway, 62, 6 years as chair of the Senate Education, Health and Environmental Affairs Committee, 16 years in the Senate. Legislators reach there maximum pension after 22 years of service, which entitles them to two-thirds of the salary of current lawmakers, now $43,500. About 120 people attend the Annapolis mayoral debate at Congregation Kneseth Israel sponsored by the League of Women Voters. COHEN VS. PANETILIDES: By comparison, the two candidates vying to be mayor of Annapolis are youngsters. Incumbent Democratic Mayor Josh Cohen is 40 and his Republican challenger Mike Pantelides, 29. The two men debated Wednesday night. Pantelides as expected constantly pounded Cohen over tax hikes, parking meter hikes, water bill hike and bus fare hikes. He also criticized a reduction of services, including a privatization of trash collection that cut pickups to once a week, though reducing trash fees. “We have a culture of taxing and spending in Annapolis,” said Pantelides, who grew up in Annapolis, as did Cohen. Annapolis is a Democratic city, but Pantelides is hoping that the Democrats who voted for Cohen’s challenger in the primary will come over to him in the Nov. 5 election. TEACHERS ENDORSEMENT: The Democratic candidates for governor have been rolling out their education proposals this week partly in preparation for the battle over the endorsement of the Maryland State Education Association, the teacher’s union, which will take place Oct. 19 in Ocean City. The only candidate for governor addressing the teachers next Friday who actually belonged to the teachers union is also the candidate least likely to win their backing — Harford County Executive David Craig. He is a Republican who spent 34 years as a teacher and a school administrator but his party label makes the union backing improbable. Craig was a member of the union when the Harford County Education Association went on strike in 1976, Ellington noted, and while Craig didn’t support the strike — illegal then as it is still now — he said Craig didn’t cross the picket line. He knows that as a Republican, people suggest he wants to cut education, but “that’s the farthest thing from my mind.” His wife Robin is a public school teacher, as is a daughter, and Kittleman did student teaching in Howard County before he turned to the law. “We’re not going to be remembered for how wealthy we are,” he said, but for helping those in the community who are struggling. Herb Sweren and Barry Silverman worked in political campaigns for years as an avocation, while they pursued careers in marketing and advertising. But a couple of years ago, after working together on a Baltimore County campaign, they decided to put their professional skills and political experience into a business using the latest technology that could improve the ground game for state and local candidates. This year, they launched CampaignOn.